Built late in 1999, NAGEC is a 45 stall horse boarding and training barn. Located on 96 beautiful acres of pasture, hay fields, cross country fences, manacured gallop lanes, and wooded trails we offer something for everyone. 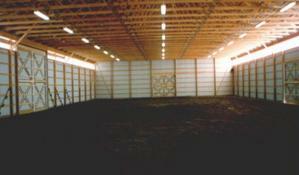 Our 12x12 stalls are outfitted with rubber mats, automatic waterers, and 3x3 window to the outside. Our 10 x 10 stalls are outfitted with bucket water and a 3 x 3 window to the outside. Over 22 acres of pasture fenced with 3 board wood fence allow the horses plenty of turnout when weather allows. We have just added 2 new paddocks, for a total of 3, to be used as winter turnout when mother nature makes pasture turnout impossible. The horse barn has all Orion lighting system and overhead fan system to keep the barn light and cool in the summer. Insulation and a heater keep the barn about 30F in the winter. Heated and airconditioned tackroom, Lounge, and restroom provide respite for our human friends. New Albany Granville Equestrian Center is family-owned and operated right here in Johnstown, Oh. Since our barn opened its doors in 1999, we’ve treated every customer like they were a part of our family. Other barns may offer similar services, but our services come with a personal touch.